Today is the first day of summer! Although, I would argue that it’s felt like summer for a few weeks now… hehe The sweltering sun is hard to ignore, and not exactly my favorite element of summer. I’m more of a fall, cool and crisp weathered gal. Don’t get me wrong, I like the sun. I just don’t love all of the heat and humidity. So I thought I would make a list of ideas for your summer bucket list! Last year I made a list of all that I wanted to do and try throughout the course of the summer. It was a neat way for me to make the most out of my summer. So if you find yourself bored or lacking ideas, use mine or make your own list! 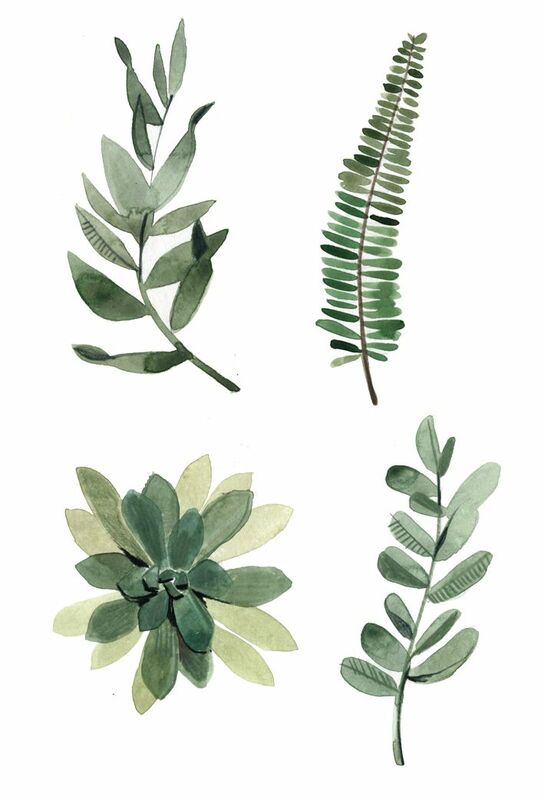 Plant something- a garden , flower, herb, or succulent! As long as I can remember, I have loved coffee! It’s one of those things for me that puts a smile on my face and makes my heart happy. In my opinion no event is complete without a cup of Joe. My sisters also have equal obsessions. Anytime were together, my mom actually gets annoyed and waits for the question, “Can we stop at Starbucks?” Haha Like I said, no trip is complete without some Joe! However, coffee can be expensive. Grabbing one here and there adds up, especially if you regularly go to Starbucks. I’m honestly a lover of all coffee, and I haven’t met a cup that I’ve stuck my nose up at yet! hehe So as long as I have my stevia and they have almond milk, I’m a happy camper! I’ve even grown to like coffee occasionally black or as long is I at least have stevia, because unfortunately, most, but not all places offer almond milk. Anyway, to cut down on costs, the economical choice would be to use a thermos or Tervis cup and make your coffee at home. Though, if your like me, and you like froth, coffee at home just isn’t quite the same. I actually tried putting my coffee once in a jar and shook it to achieve froth. All I got was some sad bubbles. I also tried boiling it, which resulted in simply hot almond milk. Then the other day, it hit me to blend my coffee! I’m actually not quite sure what prompted me to try it, but I did! And the result… was perfect! Something in the blending process actually creates a thick, creamy layer of froth, and unlike my other methods, it doesn’t dissolve. I love fall! I have a tiny obsession…. well a BIG obsession! I love everything about it. The cool weather, camping, campfires, sweaters, boots, apples, apple pie, pumpkins, pumpkin lattes, football games, and the color burgundy! 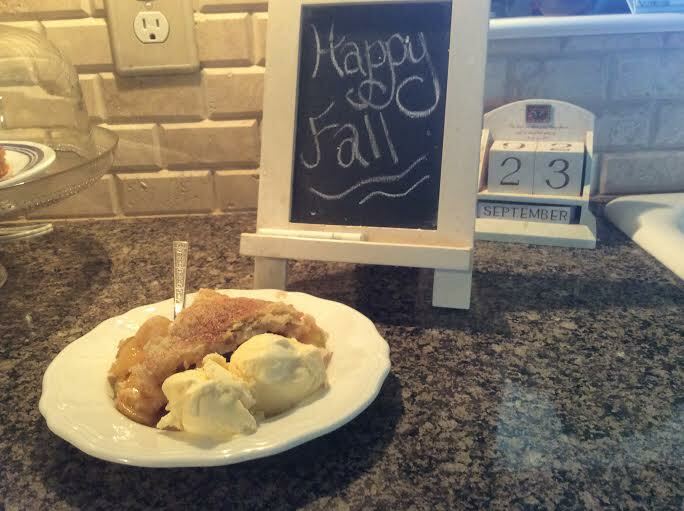 Soooo anyway today is the first official day of Autumn and I thought, what better way to celebrate than to start with an amazing apple pie!! 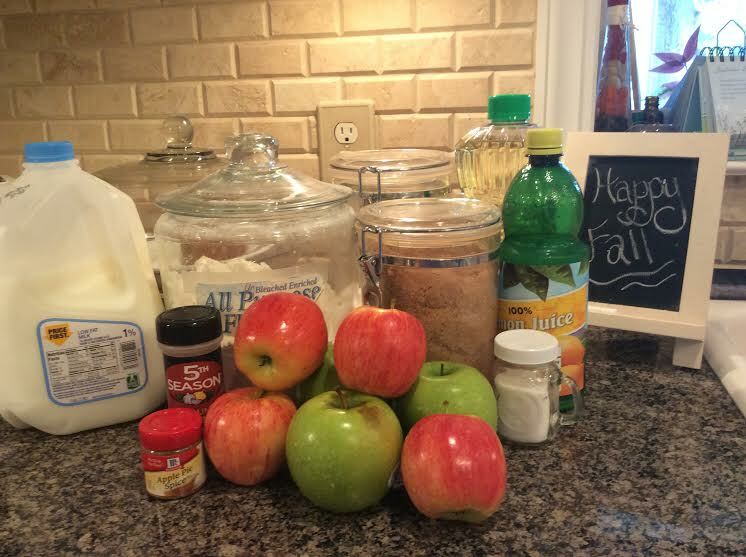 Apple pie is by far my favorite fall time dessert! 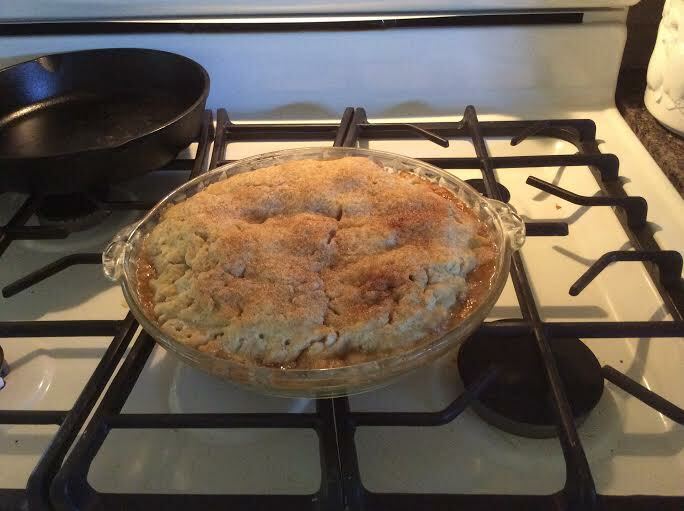 P.S I found this pie crust recipe about a year or so ago and it is delicious! Mix all of the crust ingredients together. Then mix them with a wooden spoon. Once the wet and dry ingredients mix, you can use your hands to form the dough. 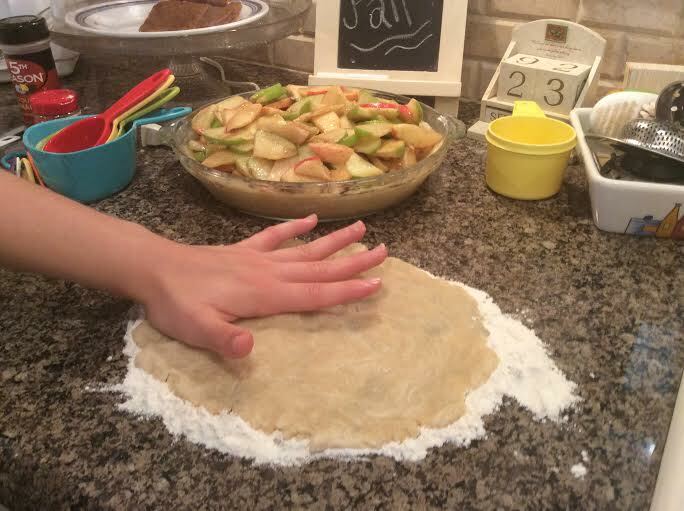 Now slice your apples and mix in the sugars, flour, lemon juice, and spices, and spread your dough in your pie pan. Next make the pie crust recipe again. After you have made it, sprinkle some flour on your surface and using your hands “roll” out the dough. You will probably have a hard time picking the dough up, but do the best you can and whatever falls a part you can piece back together on the pie. Before you pop the pie in, lightly coat the crust in either milk or egg whites, and sprinkle some cinnamon sugar on top. Then put it in the oven at 350 degrees, checking it after 20 minutes. Then check the pie in 5 minute increments after that. Once it is out of the oven, cut a slice and scoop some vanilla ice cream on top! Then ENJOY!! Preheat your oven to 350 degrees. Beginning with the crust, put all of the pie crust ingredients in your pie pan. The perfect thing about this crust is it is oily enough that you don’t have to grease it before hand 🙂 Now with a wooden spoon mix the ingredients. 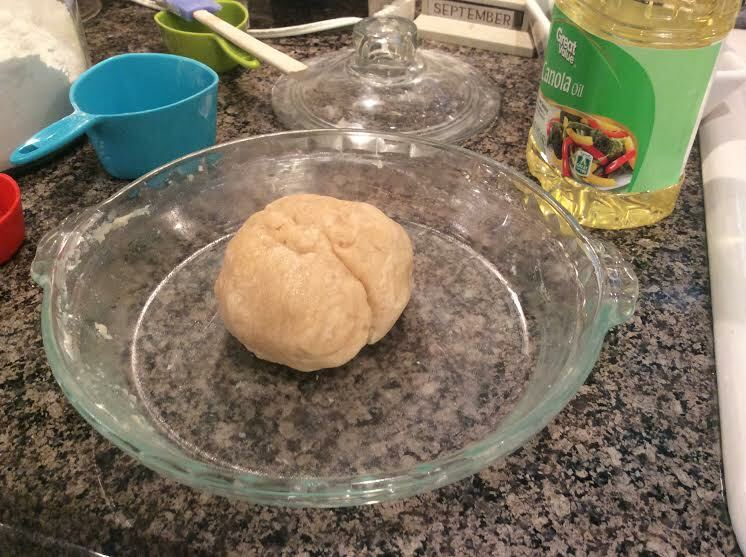 Then, using your hands, finish mixing the ingredients and form a ball of dough. Next spread the dough out in your pan and set it aside. Now, grab a cutting board and slice your apples. I used an apple cutter, then cut the apples more thinly using a knife. In bowl toss all of your apple slices (whether or not you peel the peeling is your preference) along with all of the sugars, spices, flour, and lemon juice. 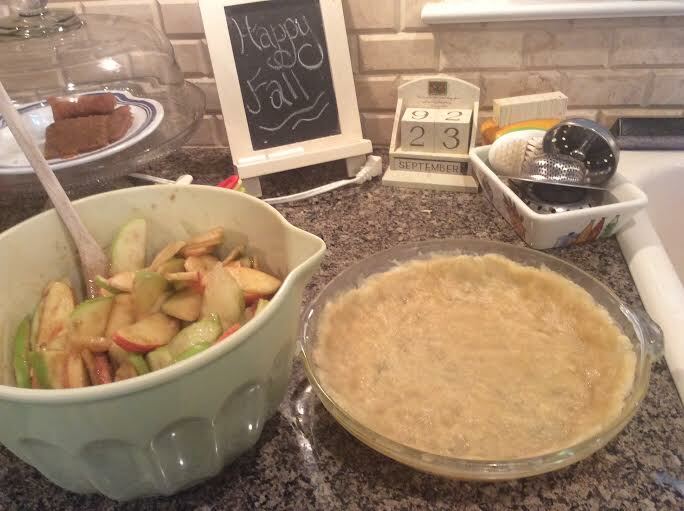 Once you have finished, pour the apple slices in the pie pan, and in another bowl make the crust a second time. After you make the crust, sprinkle some flour on your surface and spread the dough out using your hands. The crust will probably try to fall a part when you try to pick it up, but do the best you can. Whatever falls a part you can piece back together. After you put the crust on top, apply either milk or egg whites and then sprinkle some cinnamon sugar. Now you are ready to put the pie in the oven! My pie took somewhere around 35 to 40 minutes, so I would put your pie in the oven and set the timer for 20 minutes then after that set your timer every 5 to 10 minutes to check on it. Also, with this crust recipe the crust gets “crusty” without turning very brown so make sure to not over bake it. I hope you enjoy this pie as much as I did/do!! Just be sure to add a few scoops of vanilla ice cream! Let me know what you think! And…. happy first day of fall!! I am so excited that you have decided to visit my blog! Starting this blog was taking a leap of faith and hoping a net would appear. I thought it would be a neat way for me to express myself and inspire others! However, I doubted myself because I didn’t have any experience, and I didn’t know if my content would be enough. Starting anything at first can be scary, but I believe God wants us to use our talents and passions for his glory and just take a single step. He will guide us the rest of the way! With this blog, all I know is that I am passionate. God has given me a unique passion and zeal for life. And I want to share it with YOU. Life to me is wonderful. What I hope you experience when you visit this blog is inspiration for your life. I believe God cares about the details of our lives: our hopes, dreams, passions, likes, dislikes… You are the only you there is. It sounds cliché, but it is true. The common thread for humanity is our need for Jesus and His grace. As Christians that means we have a common goal: sharing the love and Gospel of Jesus Christ. The awesome thing is that how that is done is different for everyone. Some of you will be missionaries across the world, some of you will be missionaries across the street. But the bottom line is that your life is full of purpose and you have an amazing assignment from God. The question is, how does God want you to accomplish your assignment? Life was never meant to be boring or mundane, so live your best life for Jesus. I guarantee you won’t regret it.